When you have to prepare your CAAC ATPL test there are some basic things you should consider. Read some tips and be prepared for the test. The CAAC Regulations and Requirements are based on the FAR’s. They even keep the same reference chapter numbers. There might be, however, some slight differences in some subjects like Air Law, Flight Time and Duty limitations, Airspace Division and Air Traffic separation, Minimum Fuel Requirements, Notams Classes and issuance, etc. The Test will take place in a CAAC facility and each applicant will be seated at a different table. No phones, computers, calculators on your own or notes are allowed. Every Test is randomly generated by a computer. There will be a lot of people watching out to avoid you from cheating, some facilities even have cameras. Any applicant caught trying to cheat will be immediately failed and will not be able to repeat the test within 1 year. The ATP written test has 100 questions in all and it will last 2.5 hours, you need to get 70 scores to pass. If you fail, take the test 28 days later. 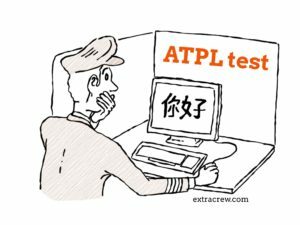 To prepare your CAAC ATPL Test, you should review the ATPL Questions file. Don’t worry, many questions are repeated or just some values are changed. Some questions will require some calculations. A basic calculator together with some charts and tables will be provided to you on the day of the test. You will find some answers which are not totally correct, accurate or sometimes simply wrong. The answer given in the questionnaire is THE RIGHT ANSWER. So if you want to pass just answer the same option as in the questionnaire. Please note that this is a generic CAAC ATPL test and it does not take into account your specific type rating. Expect to find performance exercises and load sheet for different aircraft types, the material you have is a good reference. 1Bring your passport. No calculator or any other devices are allowed. 2Answer the questions you know, leave the long ones, the exercises and those you are not 100% certain for later. 3Go to the toilet before taking the test, you won’t be able to leave the room before you are finished. 4If there is any question in Chinese, don’t panic; raise your hand and somebody will assist you (they will give you the correct answer). 5The test is computer based; please avoid touching the cable or the CPU. If it powers off you will have to take a new test from scratch. 6When you finish, review it one more time if you have time left. Be sure you do not click on the wrong option before you submit your answers, in case of doubt raise your hand and ask.